Missing decorative tiles on the Arlington Memorial Bridge. Photo courtesy of Federal Highway Administration. In what has become one of the most symbolic infrastructure patch-up projects in the nation, federal officials June 18 are set to open bid packages to repair the Arlington Memorial Bridge. Two lanes of the 1930s-era span over the Potomac River in the Nation’s Capital were closed in May as the National Park Service, the bridge owner, moved up the repair schedule to July from September. 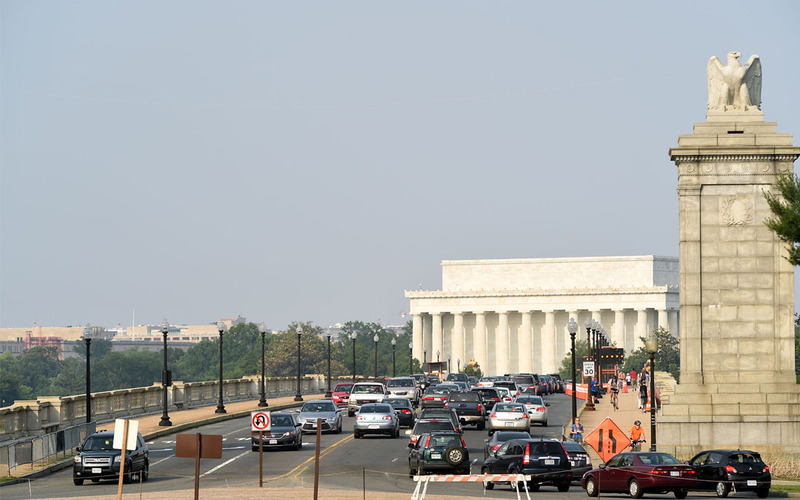 New weight limits also were imposed on the bridge, forcing the rerouting of tourist buses traveling between Arlington National Cemetery and the Lincoln Memorial. “The structure is in poor condition overall due to continuing problems related to corrosion of the steel in the bascule span, deterioration of the concrete in the arch spans, and deterioration of the sidewalks and wearing surface,” the Federal Highway Administration said in an April 24, 2013 inspection report. The Washington Post referred to the bridge’s interior as a “corroded carcass.” The same story also quoted U.S. Rep. Don Beyer (D-Va.) as saying the bridge “is not just the symbol, but the reality, of failed leadership” in Congress to deal with infrastructure investment. Other federal lawmakers and U.S. Transportation Secretary Anthony Foxx have made similar remarks. The bridge lane closure coincided with Congress passing a two-month extension of the authority for the U.S. DOT to spend money from the Highway Trust Fund, the 33rd such short-term patch in recent years. Now Congress faces a July 31 deadline to address the trust fund’s spending authority and revenue problems, just as the bridge repair work gets underway. Earlier this year ARTBA identified the Arlington Memorial Bridge as among more than 61,000 deficient bridges nationwide. With more than 60,000 daily crossings, it is the most heavily travelled span in Washington, D.C. The bid solicitation says the bridge work includes structural concrete, steel, and timber member repair or replacement, installation of additional elastomeric bearing pads, expansion joint repair or replacement, debris removal from bascule span truss members, trunnion posts, and the bottom of the trunnion areas. The roadway work includes concrete sidewalk repairs, drainage improvements and ultra-thin bonded asphalt overlay. The repairs are expected to take at least six months and cost up to $5 million, a fraction of the estimated $250 million needed to completely overhaul the 83-year-old bridge, which is listed on the National Register of Historic Places.